At the invitation of His Majesty King Mohammed VI, the Hon. Mr. Muhammadu Buhari, President of the Federal Republic of Nigeria, made the first visit of a Nigerian Head of State to the Kingdom of Morocco, on June 10 and 11, 2018. The visit reinforces the positive bilateral relationship between Morocco and Nigeria since the Royal Visit to Abuja in December 2016. His Majesty King Mohammed VI and His Excellency President Buhari affirmed their willingness to create a model of South-South cooperation. In this spirit, they welcomed the important progress made in various areas of cooperation, such as agriculture, fertilizer production, energy infrastructure and mining. 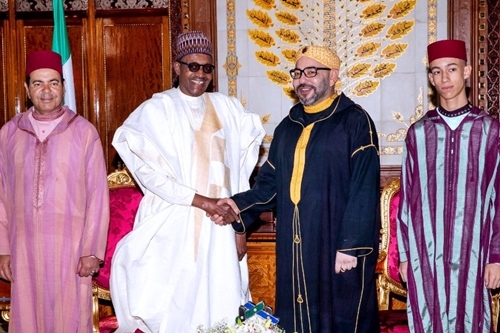 His Majesty King Mohammed VI and His Excellency President Buhari noted with satisfaction the milestones achieved and underlined their commitment to the Regional Gas Pipeline, which will connect the gas resources of Nigeria, those of some countries of West Africa and Morocco, thus promoting integration and the development of the countries. the region of West Africa. The two Heads of State also noted the progress made in other areas of bilateral cooperation, as evidenced by the Agreement between the OCP of Morocco and the Association of Fertilizer Producers and Suppliers of Nigeria to invest in Fertilizer Production; and the Memorandum of Understanding between OCP and the Sovereign Investment Authority of Nigeria on the establishment of a Basic Chemicals Platform, specifically to develop a significant Ammonia Production Plant. On the basis of their exemplary cooperation, the two Heads of State agreed to develop an association in the field of agriculture, in particular through the signing of the Cooperation Agreement on vocational training and technical supervision. On regional and international issues of mutual concern and concern, His Majesty King Mohammed VI and His Excellency President Buhari confirmed their willingness to consult and coordinate the positions of the two countries in regional and international organizations, including the African Union. His Excellency President Buhari congratulated His Majesty King Mohammed VI on the election of Morocco to the Peace and Security Council of the African Union. He also congratulated His Majesty the King on the successful completion of his mandate as African leader on migration issues, culminating in the presentation of the African Agenda for Migration and the creation of the African Migration Observatory. He also paid tribute to the personal commitment of His Majesty King Mohammed VI to sustainable development in Africa. His Majesty King Mohammed VI congratulated His Excellency President Buhari for his leadership in the regional initiative against terrorism in the Lake Chad region and praised his efforts in the fight against corruption and his role as anti-corruption champion of the African Union. The two Heads of State, in the spirit of the holy month of Ramadan, underscored their commitment to moderation, tolerance and peaceful coexistence, as Islam teaches. They expressed deep concern about violent extremism, terrorism and the persistence of threats to security in Africa. They affirmed their determination to strengthen cooperation in efforts to combat radicalization in Africa and beyond. At the end of the work visit, the Hon. Mr. President Buhari, on behalf of his delegation, expressed his deep appreciation for the warm welcome and hospitality of His Majesty King Mohammed VI, the Government and the brotherly people of Morocco.